Expectant mothers who were more fit before pregnancy are at lower risk of developing gestational diabetes, according to a new study from the University of Iowa. The findings illustrate the importance of improving fitness before a woman becomes pregnant. Gestational diabetes, a condition in which women develop diabetes during the last half of pregnancy, affects up to 14 percent of pregnant women in the United States, according to data from the Centers for Disease Control and Prevention. Women with gestational diabetes are more likely to develop type 2 diabetes after giving birth. 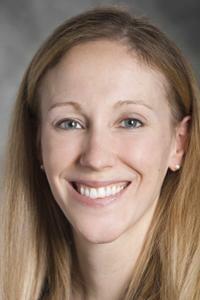 People interested in becoming more fit can do so by engaging in at least 150 minutes of moderate to vigorous physical activity per week (30 minutes per day, five days per week), says Kara Whitaker, assistant professor in the UI's Department of Health and Human Physiology and corresponding author on the study. "Women are very careful during pregnancy with what they eat and the exercise they get," Whitaker says. "But the study shows women should engage in these healthy behaviors before they get pregnant as well." Whitaker's team analyzed data from 1,333 women over a 25-year period (1985 to 2011) who enrolled in a National Heart, Lung, and Blood Institute study called Coronary Artery Risk Development in Young Adults (CARDIA). The women completed seven study visits after first being enrolled, reporting whether they had become pregnant or gave birth and whether they developed gestational diabetes. Researchers also performed a fitness exam during the first study visit by testing whether the women could walk for two-minute intervals on a treadmill at increasing speeds and on steepening inclines. Over the study period, 164 women developed gestational diabetes. Using that information, Whitaker's team determined that pre-pregnant women with high levels of fitness had a 21 percent lower risk of developing gestational diabetes than did those with lower fitness levels. "We would expect to see this reduction in gestational diabetes risk if women had moderate improvements in fitness–going from fair to good fitness, for example" says Whitaker, who joined the UI in January 2018. "The main point is, it's important to get in better shape before you get pregnant," she says. The findings could be used by medical professionals to recommend higher pre-pregnancy fitness to patients, especially those at greater risk for gestational diabetes. "If female patients who are considering pregnancy weren't meeting physical activity guidelines (as outlined by the American College of Sports Medicine), then a doctor could write a prescription, such as for a walking program," Whitaker says. "Many women who become pregnant and later develop GDM (gestational diabetes mellitus) already have elevated metabolic risk factors before pregnancy," says Erica Gunderson, an epidemiologist and senior research scientist at Kaiser Permanente Northern California and a co-author on the study. "Higher physical activity before pregnancy may lower risk of GDM by improving glucose metabolism and preventing excessive weight gain." The study, "Pre-pregnancy fitness and risk of gestational diabetes: A longitudinal analysis" was published online March 8 in the journal Medicine & Science in Sports & Exercise. Contributing authors include Katherine Ingram from Kennesaw State University in Georgia; Duke Appiah from Texas Tech University; Wanda Nicholson from the University of North Carolina-Chapel Hill; Wendy Bennett from Johns Hopkins University; Cora Lewis from the University of Alabama at Birmingham; Jared Reis from the National Heart, Lung, and Blood Institute; and Pamela Schreiner from the University of Minnesota. The National Heart, Lung, and Blood Institute and National Institute of Diabetes, Digestive and Kidney Diseases, branches of the National Institutes of Health, funded the research.